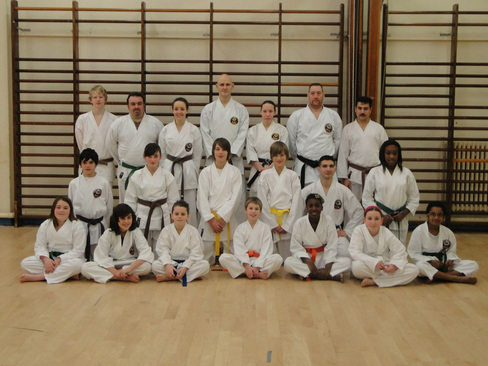 Well done to all those who graded at Royds Hall on 18th Dec.
All passed and did us very proud. At this session Junior and Senior Student of the year 2010 awards were presented. These awards are given based on commitment to training, attendance at classes, seminars and competitions and level of improvement. This year was a close thing for the Juniors with several students doing very well this year. 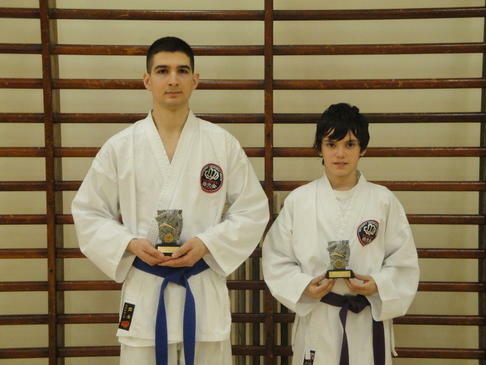 In the end the award for Huddersfield Shukokai Student Of The Year 2010 went to Louis Work, who has shown good improvement, attended several seminars and squad sessions and also won 1st at the recent Welsh Shukokai open tournament.......Well done Louis! The Seniors award was easier to decide. Nicolos Doropoulos never misses a chance to train, has been on several courses and also entered his first tournament this year where he took 2nd place. Well done Nic!